Which Black Mirror technologies would Brits actually be willing to use? January 29, 2018, 10:32 a.m. The fourth series of hit show Black Mirror was released at the end of last year, once again capturing the imagination of viewers with its exploration of humanity’s relationship with technology. Writer Charlie Brooker’s modern take on “The Twilight Zone” explores unnerving features of the modern world, with each stand-alone episode featuring near-future technological innovations. While the show evokes a dystopian tone, depicting the macabre unanticipated consequences of these technologies, cast under a different light many of the technologies would be met with excitement. Now new YouGov research has put eleven of the innovations to the public to see which they would want to use. 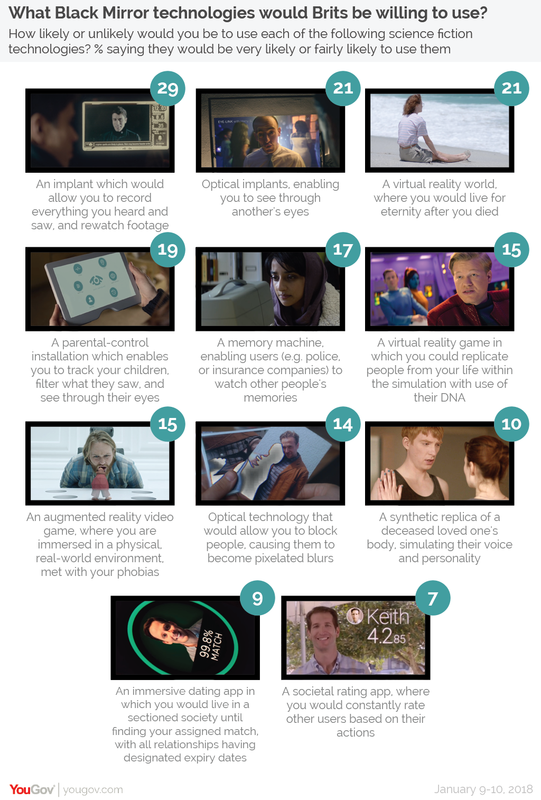 Season 1 featured an implant allowing users to record everything they heard and saw. Footage could be stored and rewatched at any time by mirroring it onto a screen. Almost three in ten Brits (29%) said that they would be willing to use the technology if it existed, making it the most popular innovation out of the eleven asked about. By contrast, a societal rating app – where users would rate other people for every interaction – was the least popular. While only 7% of Brits said they would likely use it, people in China may soon find themselves without a choice in the matter, with the communist government having mooted plans to introduce such a system in the near future. Young people are consistently more likely to want to use Black Mirror technology than their elder counterparts. This gap was greatest in the example of a virtual reality world where users would live for eternity after death. A significant amount of 18-24 year olds (44%) said it was likely they would use this, compared to 16% of 50-64 year olds, and only 8% of 65+ year olds. Likewise, men tended to be more likely than women to want to use the near-future technologies, with virtual existence after death again being the technology with the biggest difference of views (28% of men would use it compared to 14% of women). Men are also more than twice as likely as women (21% vs 9%) to be willing to use an augmented reality video game where they would be met with their phobias in a physical, real-world environment. Season 4’s episode ‘Arkangel’ explores parental anxiety and desire to be in control of their children, depicting a mother who has her daughter implanted with a chip that broadcasts her location, can filter out distressing sights and even see through her child’s eyes and rewatch any recordings. Worryingly for the privacy of forthcoming generations of British children, almost a third (31%) of parents say they would be likely to use such technology if it existed (compared to 19% of the general population).